People in Northern Ireland do not understand how charities are funded nor how they are run, according to a new survey carried out by MORI on behalf of NICVA in the wake of the chief executive pay controversy. 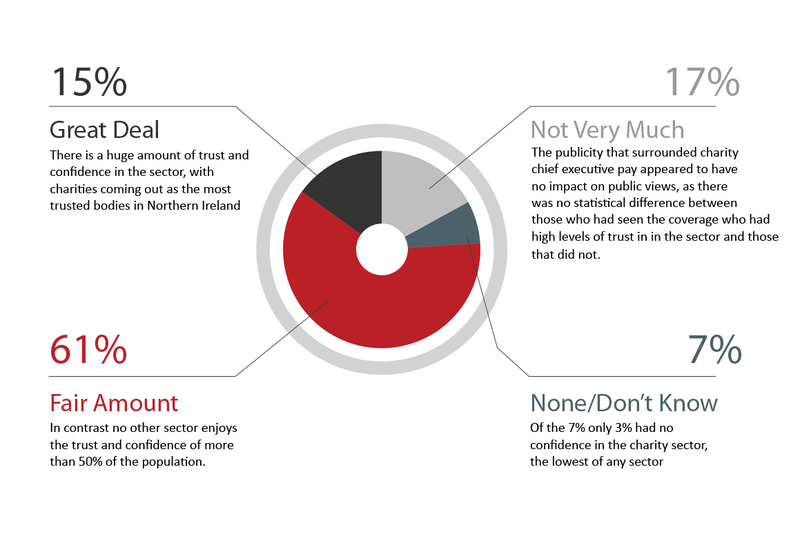 Despite this there is a huge amount of trust and confidence in the sector, with charities coming out as the most trusted bodies in Northern Ireland. Just under 90% of the population believe they play an important role in society and three quarters of people either have a great deal or a fair amount of trust in them. In contrast no other sector enjoys the trust and confidence of more than 50% of the population. Local authorities come second followed by private sector companies with political parties in last place with an alarmingly small 17% of people saying they either had a great deal of trust or a fair amount of trust in them. Almost a third said they had no trust or confidence in them whatsoever. The poll was carried out in the wake of the publicity that surrounded charity chief executive pay. Interestingly that controversy appeared to have no impact on public views, as there was no statistical difference between those who had seen the coverage who had high levels of trust in the sector and those that did not. People were also asked how their trust in the sector could be improved: publishing salaries came third after demonstrating more clearly how donations are spent and demonstrating the impact of the work carried out. What would most increase your level of trust or confidence in charities? Where confusion was evident was over which types of organisations were charitable in law. Half recognised disability charities as such, with animal charities the second most recognised. However only 12% realised universities were charities and the lowest recognition of all, at 10% was for those charities involved in economic and community development and employment. There is further, and perhaps, even more concerning lack of understanding of where charities get their funds from: with 69% believing they come from public donations and only 7%, for example, realising that government funding is also involved. Where do charities in Northern Ireland get their main source of income? Likewise with running costs. Here there is a diverse spread: going from the 6% who believe that just one per cent of funding goes to running the organisation to 11% who believe every penny raised or given goes to the running costs.